Dedicated to the doctor of medical sciences, professor, scientist-otolaryngologist, who created the scientific school of otolaryngology in Ukraine - Kolomiychenko Alexei Sidorovich. Oleksiy Sidorovich is the organizer and the first director of the Kyiv Research Institute of Otolaryngology. Has made a significant contribution to the development of tonsillary problem, diagnosis and treatment of reduced hearing, inflammatory processes of the middle ear, conservative therapy of major diseases of the ear, throat, nose, occupational pathology of the hearing and the like. He initiated experiments aimed at the clinical application of ultrasound and laser radiation for the diagnosis and treatment of otorhinolaryngology diseases. 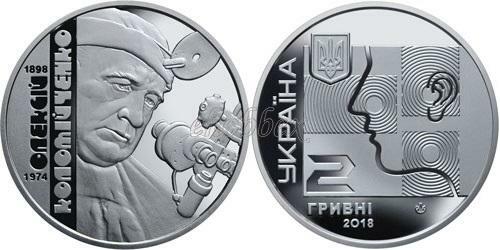 On the obverse of the coin is placed: on a mirror background, a stylized composition: on a rectangle, a decorative image of a human profile, which symbolically highlights the organs treated by a scientist; Vertical inscription UKRAINE (left), to the right of which is the Small State Emblem of Ukraine; beneath: the face value and the year of issue of the coin - 2 / ГРИВНІ / 2018; The logo of the Banknote-Mint of the National Bank of Ukraine (right).